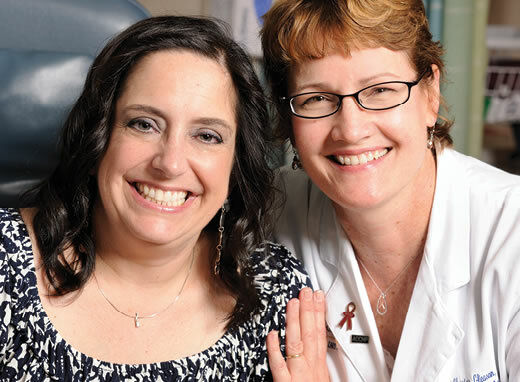 Multiple myeloma patient Cindy Sullivan with nurse practitioner Charise Gleason. Sullivan is in a trial testing a new combination of drugs. Winship Cancer Institute's clinical trials program is growing steadily. In 2013, 760 patients were enrolled in 250 Winship clinical trials. Robin Roberts was able to return to her host spot on Good Morning America. Melissa Etheridge was able to record more songs. Brandon Davis was able to go back to playing professional ice hockey. All these feats were made possible because somewhere, at some time, a patient enrolled in a clinical trial and received an experimental treatment for the first time. "The many successful treatments we have for cancer today are here because someone was willing to try a new drug in a trial," says R. Donald Harvey, director of the Winship Phase I Clinical Trials Section. "Without clinical trials, we would not be able to move medicine forward." A clinical trial is a research study that tests new ways to prevent, diagnose or treat disease. Trials investigate promising new drugs, drug combinations, new approaches to surgery or radiation therapy as well as novel treatments such as immune or gene therapies. New treatments make it into clinical trials only after they have spent years undergoing development in the lab and testing in animals. Testing in humans is conducted in three phases over many years before a new treatment can be approved by the U.S. Food and Drug Administration (FDA). Pulling together everything involved in running a clinical trial takes a team approach. "An entire group needs to work together to run a trial, including basic scientists, clinician scientists, research coordinators, research nurses, pharmacists, and regulatory specialists," says Bassel F. El-Rayes, associate director for clinical research and director of the gastrointestinal oncology program at Winship. "That's what a cancer center like Winship does. It brings all these people together under one umbrella." It's something Winship does quite well. Since 2007, a whopping 75 percent of all new FDA approved cancer drugs have been tested through a Winship clinical trial. Fueled by the strong scientific research base at Winship and Emory University School of Medicine, 40 percent of all the trials here are investigator initiated. That means the drug or treatment being studied grew from the basic research of a Winship investigator. "Our investigators prefer to write their own studies and to be on the forefront of research," says Harvey. "Having investigator-initiated studies is a focus of our research mission." Winship's clinical trials program is growing steadily. In 2013, 760 patients were enrolled in 250 Winship clinical trials. This year, investigators hope to enroll over 800 patients. And Winship has been selected as a Lead Academic Participating Site for the National Cancer Institute's (NCI) new National Clinical Trials Network (NCTN). The NCTN will serve as NCI's primary infrastructure to conduct Phase II and III cancer clinical trials. NCTN clinical trials will enroll over 17,000 patients per year with a variety of cancer types and from diverse backgrounds. The clinical trial work done at Winship is critical to advance the treatment of cancer. "There are very, very few diseases out there for which we feel we have the best treatment possible," says El-Rayes. "There is always room for improvement, especially in cancer treatments. Clinical trials are the way for us to either improve outcomes or produce the same outcomes with fewer side effects."